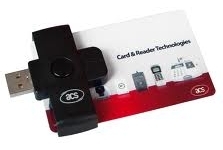 ACR38U PocketMate is a smart card reader that has more to it than meets the eye. No larger than a standard USB token, it transforms into a smart card reader for full-sized contact smart cards with just a single swivel motion. It is capable of supporting demanding smart card applications, providing the perfect balance between reliable functionality and design aesthetics to meet your security needs in applications like e-Banking, e-Payment, Physical and Logical Access and e-Government. Housing the ACR38 core, ACR38U PocketMate supports ISO 7816 Class A, B, and C smart cards (5 V, 3 V, and 1.8 V), microprocessor cards with the T=0, and T=1 protocols. In addition, it supports a wide variety of memory cards in the market, including the Department of Defense Common Access Card (CAC) This makes it ideal for a broad range of solutions, such as PIV Application and Digital Signature. The highly compact ACR38U PocketMate is specifically designed to be brought and used anytime, anywhere. Being a PC/SC and CCID compliant device, ACR38U PocketMate can easily be integrated into a PC environment, with drivers that are compatible with Windows, Linux and Mac operating systems. Also, ACR38U PocketMate may now be used on mobile devices running the Android™ platform versions 3.1 and above. With its various features, this FIPS 201 certified smart card reader is the perfect device for your smart card solution.